PHOENIX, AZ--(Marketwire - October 27, 2009) - PetSmart® (NASDAQ: PETM) presents pet parents with thousands of holiday gift ideas that can fulfill the wishes of their pets this holiday season. 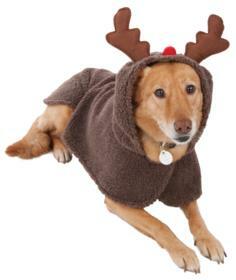 According to a national PetSmart survey, 95 percent of pet parents give their pets a gift or special treat this time of year, and the nearly 155 million pets expecting gifts can look forward to receiving the items they want most with PetSmart's broad selection of products at exceptional prices throughout the season. Homeless pets will also benefit this holiday season, thanks to the exclusive Luv-A-Pet "Chance." 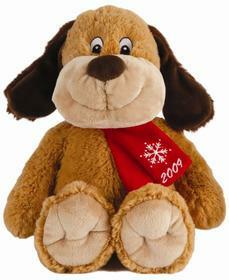 Chance is an overstuffed dog toy and collectable this season available for only $5. Ten percent of the overall proceeds from Chance sales will go to PetSmart Charities, which has saved the lives of more than 3.6 million homeless pets. Safari Christmas animal print and jungle character toys, such as the Plush Giraffe and Plush Elephant with Santa Hat ($5.99 US, $6.99 CAN) or share the tradition of Christmas with Santa's Workshop toys like the Gingerbread Boy with Rope ($4.99 US, $5.99 CAN). Cozy "Naughty" or "Nice" novelty tees ($14.99-$15.99 US, $16.99-$17.99 CAN), snowman pajamas (XS-M $9.99 US, $10.99 CAN, L-XL $10.99, US $11.99 CAN), a red and green cable knit sweater (XS-M $16.99 US, $18.99 CAN, L-XXL $17.99 US, $19.99 CAN) and princess hoodies (XS-M $14.99 US, $16.99 CAN, L-XL $15.99, US $17.99 CAN). Giant 24" knotted bone or the chicken-wrapped rawhide treat, all less than $9.99 (US and CAN). New squeaker mats, featuring 10 squeakers in every toy ($9.99-$16.99 US and CAN), or their own holiday-themed loofah dog toy, such as the nutcracker, wrapped gift, Santa, snowman, reindeer and Hanukkah ($4.99-$9.99 US and CAN). Large Heated Wellness Bed ($125.99 US) or the Super Thick Orthopedic Bed ($79.99-$99.99 US). 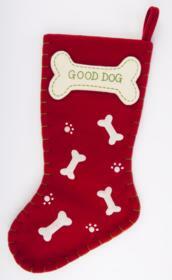 PetSmart offers high-quality products at a superior value throughout the year. This holiday season, PetSmart gives pet parents the gift of additional savings with seven consecutive weeks of discounted gifts, with a special sale on Black Friday that features hundreds of items up to 50 percent off. Other deals and discounts can be found at local PetSmart locations during limited-time sales on: November 6-8, November 13-15, November 20-22, December 4-6, December 11-13 and December 18-25.